Every year the mandal adopts financially challenged students and pays for all the education expenses required for one complete year. 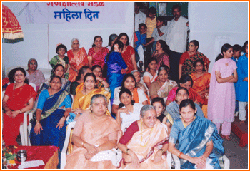 Shri Kasba Ganpati Mandal believes in empowerment of women. Keeping this thought in mind, the mandal celebrates ‘Women’s Day’ during the Ganpati festival every year. On this day, all the activities such as, Puja, Aarti, holy abhishek and other rituals are looked after by the female volunteers. Apart from that, the mandal also organizes competitions like – Rangoli, Recipes, Flower decoration, Ukhane and so on. All the activities right from planning to execution are undertaken by women on that day. 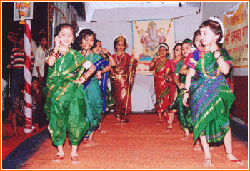 Every year, the mandal organizes different competitions for children in the age group of 3 to 12 years. Several competitions are conducted by the mandal such as, drawing, singing, drama, solo dance, and so on. Apart from these cultural programs, the mandal also conducts sports competitions like Caroms, and Chess competitions. All the winners are awarded by the dignitaries. Thus, the mandal encourages the talents of the children and motivate them to develop their confidence, team work, conversational skills and religious and spiritual endeavors. Shri Kasba Ganpati Mandal, has been always on the forefront to help the victims of the natural calamities. The mandal had given a donation of Indian rupees 51,000, in cash and in kind during the earthquake at Latur, which took place on 30th September 1993. Again, when all Indians were celebrating Republic Day on 26th January 2000, the earthquake created havoc in Bhuj, Gujarat. More than 10,000 Indians lost their lives in that calamity. The Mandal had sent a team of volunteers and a cash donation of Indian rupees 51,000. The volunteers stayed there for 15 days and did a yeoman service to the people who lost their belongings, and kith and kin in the earth quake. The mandal also went to the rescue of thousands of people during the Tsunami that engulfed the coast of Bay of Bengal. The mandal donated Indian rupees 51,000 in cash to support and reform the lives of these people. 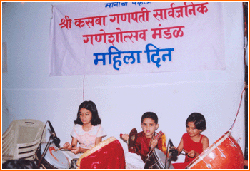 Keeping with the tradition of social service, the mandal has adopted a village, ‘Helwak’, in western Maharashtra. The village was completely destroyed during the floods. The mandal built many houses and donated computers, sewing machines, and other essential equipments to villagers, to empower and enable their livelihood. Due to some miscreant activities, the Bhandarkar Institute was destroyed in 2005. The well furnished library which had the ancient books in Indian Philosophy and Technology was completely destroyed. It was a serious concern for the Bhandarkar Institute and ultimately for Pune as a whole. The mandal had given donation in cash for the rehabilitation of this institute. The mandal has conducted numerous courses of Art of Living Foundation for the devotees. More than 1,000 people have benefited by these courses. The Art of Living Foundation is a NGO founded by Sri Sri Ravi Shankar. The course also involved Sudershan Kriya, which helps people to improve their life in all dimensions. The mandal is prompting the art of living course throughout Pune. Few years ago, Pune was majorly affected by Swine Flu. All blood banks in Pune were falling short of blood to treat the patients. Keeping the thought of building a strong community in mind, Shri Kasba Ganpati mandal took the lead and organized a blood donation camp during the Ganpati festival and donated all the collected blood to the blood banks to treat the Swine-flu affected patients. Since then, organizing blood donation camp has become an integral part of the Ganpati festival for Shri Kasba Ganpati mandal.